64 Delhi City’s night shelters in a pathetic condition as mercury levels dip. Delhi,As the festive mood envelopes the city in the last week of December, with most Dilliwallahs wishing for more chill to kick in, there are several ‘areas of darkness’ in the Capital where people are praying that the mercury doesn’t slide any further. For, they have no roof over their head, and those few who are provided with one by the government, they have to live in a dark, dingy refuge with an overwhelming stink of stale sweat floating at all corners. Yet, no one is complaining at this night shelter in Kashmere Gate, one of the seven in the area that can accommodate more than 7,000 homeless in this Old Delhi locality known for its large beggar and homeless population. For they are the ‘lucky’ 10 per cent of the homeless population who manage to get a place inside Delhi’s night shelters. Indu Prakash, executive member of Shahri Adhikar Manch, an NGO working with the city’s homeless, tells Mail Today that there aren’t enough night shelters for the poor. “The city currently has 198 night shelters along with 40 additional tents. Each shelter home can pack around 35-40 people. Currently, the city has about 1,50,000 people who have no roof over their head. 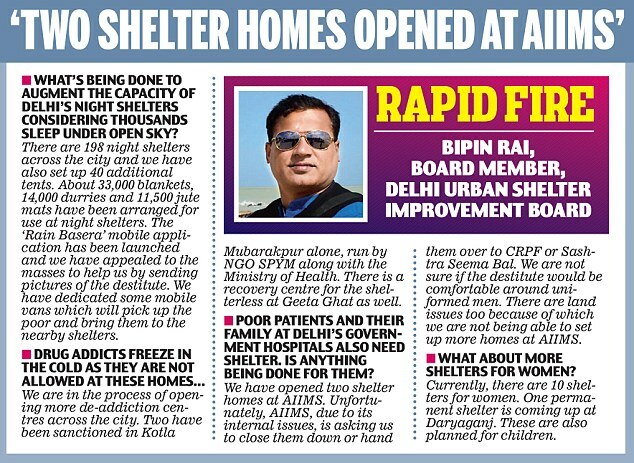 As per the Master Plan Delhi 2021, there should be at least one 1,000 sqm shelter house per one lakh population. By this logic, Delhi needs 19,37,520 sq ft of night shelters. As per Delhi Urban Shelter Improvement Board’s own estimates, all its night shelters add up to an area of just 2,44,507 sq ft — a clear deficit of 87.4 per cent in the current scenario. 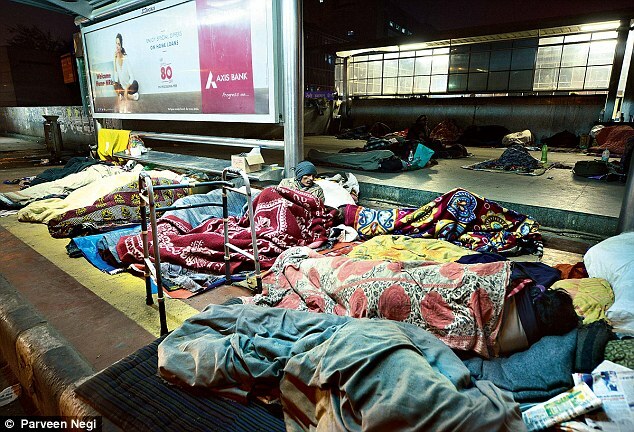 This abysmal state of night shelters in the city is the reason why thousands in Delhi still sleep under flyovers, in subways and bus stands, outside Metro stations and on road dividers, braving the bone-chilling cold and risking death by accidents. This also explains why, contrary to Delhi Chief Minister Arvind Kejriwal’s pompous claim early this month that “no homeless person will die of cold in the national Capital”, in Kashmere Gate alone 402 unidentified dead bodies of the ‘shelterless’ were found till November 23 this year. In comparison, 298 were found in 2014. “The casualty generally shoots up in the month of December, especially in the last week, as the mercury comes down to a single digit. So, we should be prepared for almost double the casualty we had witnessed last year,” says a government official on the condition of anonymity. But not all want to go to the night shelter. And the reason isn’t just the place being stinky and overcrowded. The flyover across Majnu Ka Tila has its underneath partially covered by walls. By 9pm, over 200 rickshaw-pullers and labourers gather here to call it a day. Blankets, rented for Rs 10 each, lay at the entrance. They are picked up one by one by each guest of the night. She, however, blames the government for ignoring these people. Every government hospital in the city has a long queue of poor patients in the day. At night, they jostle for space to sleep in the corridors, premises and outside pavements. AIIMS, Safdarjung, Ram Manohar Lohia and GTB Hospital, with footfall over 10,000 a day, are apt examples. When Mail Today asks Sunil, a 25-year-old accompanying his heart-patient wife at AIIMS, on why he lives at the pavement, he shows the hospital’s medical card. If staying at Delhi’s night shelters is difficult for men, it is nearly impossible for the women. A sizeable population of Delhi’s drifters comprises women, most being labourers, beggars and the abandoned elderly. 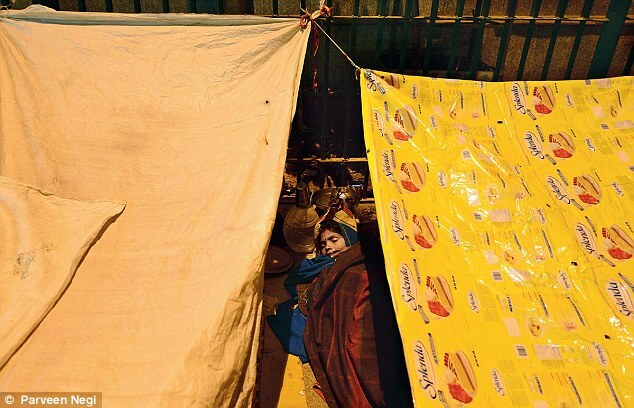 To get a deeper understanding of the conditions of night shelters, the chairperson of Delhi Commission for Women (DCW), Swati Maliwal, spent an entire night at a few such facilities on October 10 this year. This included the Nirmal Chhaya Nari Niketan, which falls under the Delhi government’s Women and Child Welfare department. She regarded the condition there as “grim” and “hellish”. Maliwal, who visited the shelters along with DCW members Sarika Chaudhury and Promila Gupta, points out the problems in the hygiene and drinking water department. “As far as the conditions at Nari Niketan are concerned, there is a big issue of cleanliness. There are no separate toilets for the specially-challenged women. The number of toilets is also not sufficient. Even the food provided there is not good, and drinking water is not sup- plied throughout the day. If they feel thirsty during the day, they are forced to drink tap water,” she said. Clearly, the issue of overcrowding is omnipresent. Maliwal also said women with mental disabilities have been kept at Nari Niketan along with others, making conditions at the home “very unusual”. 173 Clamorworld Exclusive: Did The CBI Raid In Delhi Breach Legal Provisions?